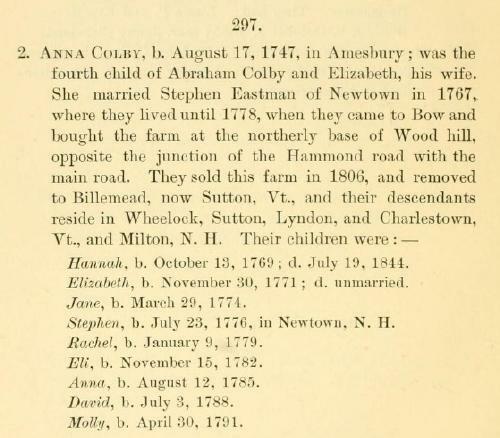 Harrison Colby, A genealogy of the descendants of Abraham Colby and Elizabeth Blaisdell, his wife, who settled in Bow in 1768, , at https://archive.org/details/genealogyofdesce00colb . Concord, N.H.: Printed by the Republican Press Association, (1895) Microfilm #896944 of the Family History Library, Salt Lake City, Utah, pp. 98-9. COLBY FAMILY & OTHERS at http://freepages.genealogy.rootsweb.com/~colby/colbyfam, /d256.html. "New Hampshire Birth Records, Early to 1900," database with images, FamilySearch (https://familysearch.org/ark:/61903/1:1:FLLP-5MF : 12 December 2014), Samuel Eastman, 16 Oct 1749; citing Kingston, Rockingham, New Hampshire, United States, Bureau of Vital Records and Health Statistics, Concord; FHL microfilm 1,000,500. Harrison Colby, A genealogy of the descendants of Abraham Colby and Elizabeth Blaisdell, his wife, who settled in Bow in 1768, , at https://archive.org/details/genealogyofdesce00colb . Concord, N.H.: Printed by the Republican Press Association, (1895) Microfilm #896944 of the Family History Library, Salt Lake City, Utah, p. 97. 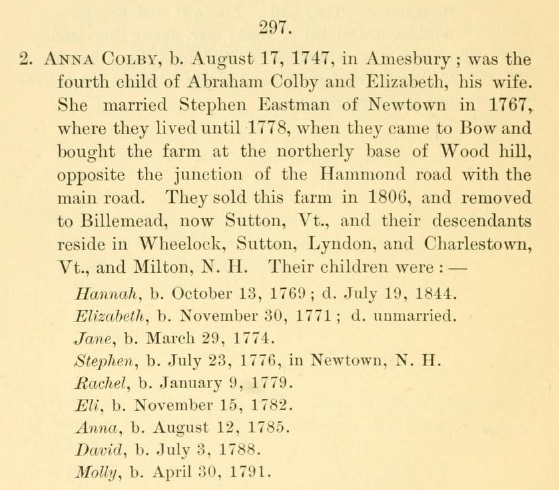 Harrison Colby, A genealogy of the descendants of Abraham Colby and Elizabeth Blaisdell, his wife, who settled in Bow in 1768, , at https://archive.org/details/genealogyofdesce00colb . Concord, N.H.: Printed by the Republican Press Association, (1895) Microfilm #896944 of the Family History Library, Salt Lake City, Utah, p. 7, 86. COLBY FAMILY & OTHERS at http://freepages.genealogy.rootsweb.com/~colby/colbyfam, /d81.html. In 1806, Stephen Eastman went to Stephen Eastman . living at Sutton, Caledonia County, Vermont. "New Hampshire Birth Records, Early to 1900," database with images, FamilySearch (https://familysearch.org/ark:/61903/1:1:FLLP-P7M : 12 December 2014), Stephen Eastman, 17 May 1747; citing Kingston, Rockingham, New Hampshire, United States, Bureau of Vital Records and Health Statistics, Concord; FHL microfilm 1,000,500. Guy S. Rix, History and Genealogy of the Eastman Family in America, , at https://archive.org/stream/historyandgenea00rixgoog . Concord, N.H.: (1901) , p. 510. Timothy Eastman was born perhaps about 1723. "New Hampshire Birth Records, Early to 1900," database with images, FamilySearch (https://familysearch.org/ark:/61903/1:1:FLLP-6JL : 12 December 2014), Benjamin Eastman, 12 Feb 1752; citing Kingston, Rockingham, New Hampshire, United States, Bureau of Vital Records and Health Statistics, Concord; FHL microfilm 1,000,500. Joseph Willard and Charles Wilkes Walker, Willard genealogy: sequel to Willard memoir, Boston, Mass. : The Willard Family Association, (1915) , p. 331. "Massachusetts, Marriages, 1841-1915," index and images, FamilySearch (https://familysearch.org/pal:/MM9.1.1/N4F8-BL3 : accessed 14 Dec 2012), Ralph Merrill and Laura B Eaton, 1911. 1920 United States. Bureau of the Census. 14th census, 1920 population census schedules, Washington, District of Columbia: The National Archives, ([193-?]) , Census Place: Danvers, Essex, Massachusetts; Roll: T625_689; Page: 9B; Enumeration District: 29; Image: 685. 1930 United States. Bureau of the Census. 15th census, United States, 1930 federal census : population schedules ; NARA microfilm publication T626, Washington, District of Columbia: Bureau of the Census Micro-Film Laboratory, ([19--?]) , Census Place: Danvers, Essex, Massachusetts; Roll: 895; Page: 10A; Enumeration District: 0032; Image: 731.0; FHL microfilm: 2340630.